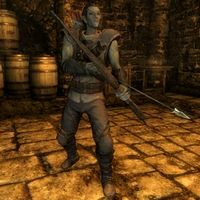 Ravyn Imyan, a Dunmer thief, used to be a Morag Tong assassin, and will join the Thieves Guild once you have completed at least three of the special reputation quests. Although he isn't an assassin any longer, Ravyn likes to keep his skills honed. He practices his archery 6pm to 10pm in the Cistern and from 10pm to 2am in the training room. He wanders around the Cistern for another two hours before taking a nap between 4am and 8am in the bed next to the Nocturnal statue. He will spend the rest of the day strolling around and chatting to his fellow guildmates, taking a two-hour break for lunch at 2pm. He wears the standard Thieves Guild armor, gauntlets, and boots. He is equipped with a leveled dagger (up to elven quality), a hunting bow and twelve steel arrows. He also carries two lockpicks and up to 27 gold coins. When first met, he'll greet you with: "I don't know, you don't look so impressive to me. I mean, you're no Gray Fox, but you must be doing something right." After that he'll be quite abrasive: "I'm busy, is this important? ", "Are you bothering me for a reason? ", or "Oh, this should be good." When you stop talking to him, he'll remark: "Finally. Now I can get back to work." or "Don't hurry back, I won't be waiting." Once you've become Guild Master, he'll temper down: "I promise to live up to your expectations." If you ask him where he's from he'll immediately tell you about his past: "Morrowind of course. Any Dunmer worth their weight in ash would tell you the same. I used to be a member of the Morang [sic] Tong." If you inquire about it he'll say: "We were an assassins guild that was sanctioned by the Empire to provide public as well as private executions. We did this in the name of Mephala, whom I used to quite fervently worship." If you point out that it sounds like the Dark Brotherhood, he'll cut you off immediately: "No. In fact, the Tong were quite the bitter rivals with the Dark Brotherhood. Where they operate within the shadows, we operated on the side of justice." If you ask him why he left, he'll explain: "I didn't have a choice. When the Red Mountain erupted in Morrowind, the Tong fled... spread to the nine winds. We made a pact that one day, we might reunite... but I believe that day is long in coming." If you ask him why he didn't join the Brotherhood he'll snap: "Have you taken leave of your senses? If the Dark Brotherhood discovered I had been a Morang [sic] Tong, they would come after me with a vengeance. Better to stay out of sight and ply my trade with the Thieves Guild than risk a contract on my head." If you reassure him his secret is safe with you he'll warn you: "I should hope so. The Dark Brotherhood is also known to place contracts on those who associate with the Morang [sic] Tong as well. So, unless you wish a visit from one of their own, I'd suggest you follow your own advice and keep your mouth shut." When you arrive accompanied by Karliah, he'll seethe: "Vex is ready to tear you apart. I hope you have a good excuse for bringing Karliah here." Once you've cleared her name, however, he'll be enraged: "Punishment's too good for Mercer Frey. The only penalty for his betrayal is death." If you get kicked out, he'll refuse to speak with you: "I may be new around here, but at least I know how to follow the rules." When talking about the Morag Tong, he mispronounces their name as the Morang Tong. Esta página foi modificada pela última vez à(s) 23h27min de 18 de setembro de 2013.